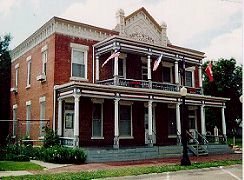 Retreat to the laid-back luxury of this century-old hotel turned Bed & Breakfast inn located in quiet, quaint Wilber, Nebraska, Czech Capital of the USA. Listed on National Register of Historic Places. The Hotel was built in 1895. 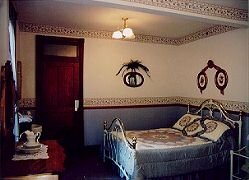 Eleven antique-furnished guest rooms, separate men's and women's shower rooms and covered balcony are all privately located upstairs. Three rooms include daybeds, four have lavatories. Hearty breakfasts are served in the first floor dining room. Czech and American favorites on the evening weekend menu include roast duck with dumplings and kraut, and other Czech Cuisine. Cocktails may be enjoyed in the dining room, the cozy Pilsner Pub or private garden. Open year-round. Children who appreciate antiques are welcome. Smoking restricted. Vacationers, travelers, business people, sports enthusisasts. Come one, come all.